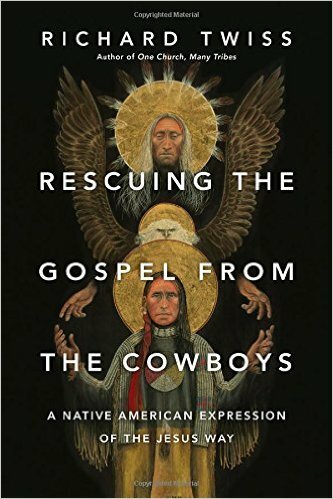 I learned a lot while reading Rescuing the Gospel from the Cowboys, but finding a succinct way to describe the book and what I learned is proving difficult. Though it wasn’t his first book, in some ways this one feels like the opening salvo from an author who had a lot more to say. Sadly, Richard Twiss died before this book was published. I suspect his legacy and teachings will be represented well by his friends, but many readers will finish this book with a peaked interest that cannot be met by the author. This is our loss, though from the little I know about Twiss – I heard him teach twice – I suspect he wouldn’t be too concerned. In some ways Rescuing the Gospel reads like a summary of a lifetime of academic and personal research. The book is this and more. Readers like me, who have little background with Native American expressions of Christianity, need to be prepared to step into this world with little handholding. At times the book can feel a bit “inside baseball” but Twiss offers enough context to keep us novices from getting lost. At its heart this is a book about the myriad of ways Native American peoples have suffered the short-sighted and ethnocentric evangelism efforts of the dominant American culture. Twiss compellingly includes first-hand accounts along with his research to show how ugly these approaches can be. In contrast to what can only be called colonialism, Twiss articulates a “Decolonizing Contextualization Movement.” It would be a mistake to understand this movement as simple window-dressing on the previous Christian mission strategies among Native Americans. Though this movement prioritizes tribal practices and customs like native dance and the pow wow, these are reflections of theological convictions, namely that God was at work among the indigenous people of North America long before anyone called it North America. For Twiss and others like him, the gospel requires a continuity with the past that honors culture and history. There is, of course, a history of doing theology this way. The early Christians were fond of looking back at their favorite Greek philosophers for resonance with their Jewish savior. It is evidence of a Christianity that was captive to race and empire that kept (and still keeps!) missionaries from expecting similar resonance from Native American people. It is also evidence of the need for a profound and ongoing repentance that must exist within those of us in the dominant culture.